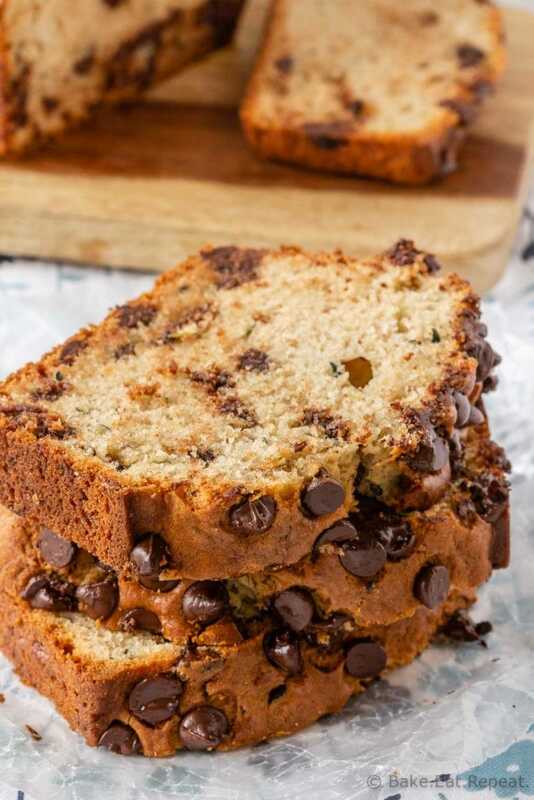 This chocolate chip zucchini bread is moist and flavourful, and filled with chocolate chips. Easy to make, it mixes up in minutes and everyone will love it! I used up that last of the zucchini sitting on my counter with several loaves of this tasty chocolate chip zucchini bread. I was really tempted to just make batch after batch of these chocolate zucchini muffins that I shared last week, just so I could have a little stockpile of them in my freezer. They were just so tasty – if you haven’t tried them yet, you should! But I decided to change things up and make a bunch of zucchini bread instead. And I’m so glad I did because it was really tasty and we all enjoyed it. This recipe makes a fairly large loaf, but it still disappeared very quickly every time I made some. This particular recipe is one that I found handwritten on a recipe card in my mom’s recipe box. I did change it a bit (I can never just leave well enough alone!) – but the recipe called for raisins and clearly it meant chocolate chips. Obviously. Chocolate is always better then raisins. Although feel free to disagree with me on that point and make raisin zucchini bread instead of chocolate chip zucchini bread. See? It doesn’t even sound as good. But hey, to each his own. If you still have any zucchini left, you should definitely use some of it to make a loaf of this zucchini bread. You won’t regret it! Unless you use raisins. Then you might. Do you have to peel zucchini for zucchini bread? No, you don’t need to peel the zucchini first for zucchini bread! You certainly can if you want, but it isn’t necessary. Leave the peel on, and get those added nutrients while saving yourself some time. How do you cut zucchini for bread? It’s best to grate it. You can use the grating attachment of the food processor or grate it with a box grater. For large zucchini, cut it into chunks, then quarter it and scoop out the seeds. Then you can grate it to use in your zucchini bread. After shredding the zucchini, I don’t find it necessary to wring out the moisture for baking zucchini bread. Just let it drain in a colander while you get the other ingredients together, and then give it a squeeze with your hands, or press it with a spoon in the colander to remove some of the excess liquid. You can definitely make this zucchini bread without the chocolate chips. It isn’t loaded with chocolate chips so some of us might prefer to increase the chocolate, rather then omit it. Although maybe that’s just me. You can replace the canola oil with a different type of oil if you like – vegetable oil, grapeseed oil, or melted coconut oil should all be fine. 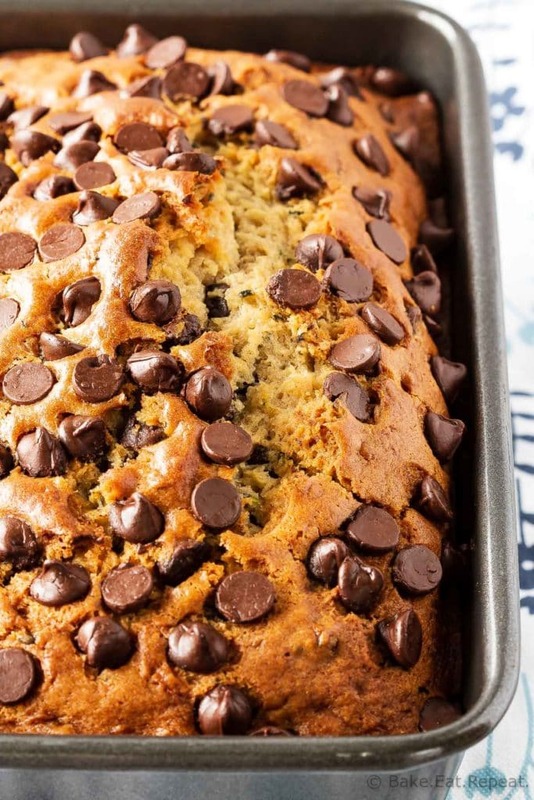 If you’d like to make this chocolate chip zucchini bread as muffins instead, it will make 12 muffins, bake them for 18-22 minutes. Preheat the oven to 350 degrees F. Lightly spray a 9x5 inch loaf pan with non-stick cooking spray and set aside. In a large bowl, whisk together the flour, baking powder, baking soda, salt, and cinnamon until well combined. In another bowl, whisk together the oil, buttermilk, eggs, vanilla, and sugar until smooth and well combined. Stir in the grated zucchini. Add this mixture to the dry ingredients and stir until just combined. Fold in the chocolate chips. Pour the batter into the prepared baking pan and smooth the top. 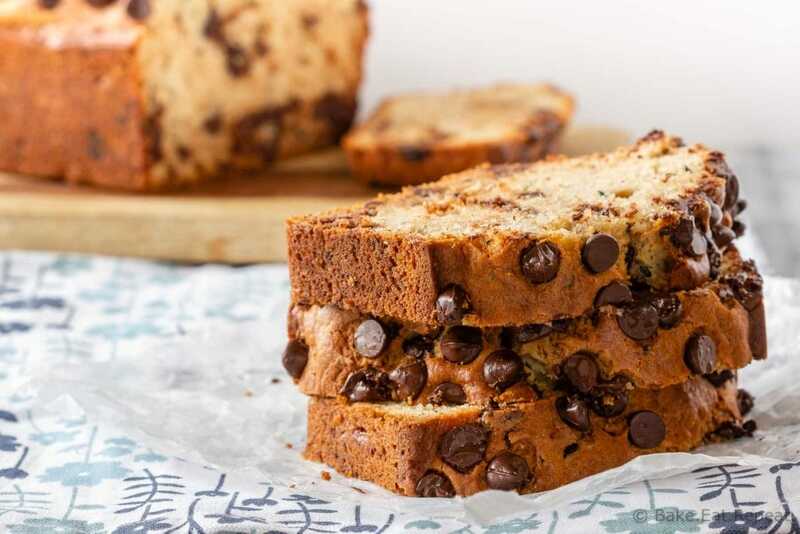 Sprinkle with more chocolate chips if desired, and bake for 50-60 minutes, or until a toothpick inserted in the centre of the loaf comes out clean. Cool for 10 minutes in the loaf pan, then remove the bread to a wire rack to cool completely. If you don’t have any buttermilk you can use 1/2 cup milk with 1 teaspoon of vinegar or lemon juice mixed into it instead. Let it sit for 5 minutes before using it. To prevent the chocolate chips from sinking to the bottom of the bread, you can toss them with a teaspoon of flour before folding them into the batter and this helps to keep them suspended in the bread while it’s baking. 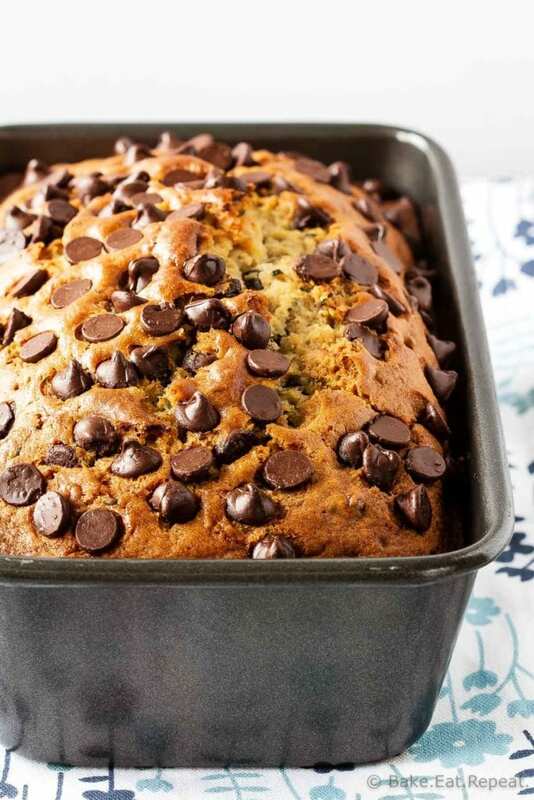 This bread is not loaded with chocolate chips - if you want it to be more chocolatey, increase the chocolate chips to 3/4 cup, or use mini chips to spread them out more. If you’d like to make this zucchini bread a bit healthier, you can omit the chocolate chips, or you can use half whole wheat flour with good results.